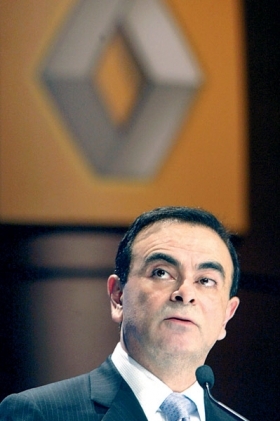 The industry will be watching Renault CEO Carlos Ghosn February 9. PARIS – Bridge players need memory, strategic thinking and a dash of boldness. Those qualities are what the auto industry expects Renault CEO Carlos Ghosn, a bridge aficionado himself, to display February 9 when he unveils his three-year plan to invigorate the French automaker. In some respects, the plan will be reminiscent of what Ghosn did in 1999, when as Nissan chief operating officer he set clear production and profitability targets. Ghosn became Renault CEO nine months ago and has now completed his lengthy, in-depth study of the company. Ghosns plan will be more than a management technique to motivate staff. After two previous such plans at Nissan, his February 9 announcement is building up to become a major event that will be closely watched by the entire global auto industry. After months of dropped hints and long gatherings with staff, Renault employees expect a challenge, but feel they know what Ghosn expects of them. And there will be differences between Ghosns plan for Renault and his revival plans for Nissan, which consisted of stiff challenges that the Japanese automakers employees successfully rallied to meet. His job at Nissan was to prevent imminent bankruptcy, but the task at Renault is to galvanize a healthy but comfortable automaker. Renault has near-zero debt, but its sales are stagnant at about 2.5 million vehicles and its automotive operating margin is expected to have fallen to 3 percent in 2005 from 5.1 percent in 2004. There are very few people left in the company who satisfy themselves with an operating margin of 3 or 4 percent, Ghosn says. Employees speculate that Ghosn will set an operating margin target of between 6 percent and 8 percent. The main thrust of his plan will be a raft of new products, helping Renault to increase sales by 1 million units in the next three years. It would be in line with former CEO Louis Schweitzers goal of reaching 4 million vehicles by 2010. To add spice to Renaults brand image, he is expected to announce a revival of Renaults Alpine sporty brand, winner of many 1970s competitions such as the 24 hours of Le Mans and the World Rally Championship. An Alpine-badged car in the spirit of the 350Z coupe that Ghosn revived for Nissan would be built in the Dieppe plant in western France where Renault builds its sporty cars. Renault insiders also expect Ghosn to announce a new plan for more upscale cars. Renaults Sandouville, France, plant for upper-range cars is expected to build a luxury SUV. And Renault may have another try at luxury sedans by sharing a platform with Infiniti, Nissans luxury brand. Those new vehicles would complement models already slated for 2007 – the second-generation Twingo small car, a third-generation upper-medium Laguna and a lower-medium SUV built by Renaults South Korean unit, Samsung. Analysts say they would welcome Renault moving upscale. Renaults future is not low-cost cars such as the Logan regardless of the budget cars initial success, analysts say. To move upscale, Renault must improve the quality of its cars and reduce maintenance costs, analysts say. It ranks well below Japanese brands such as Toyota or Honda in customer satisfaction surveys. If Renault extended its warranty to three years instead of two, that would be a strong signal, Chiron said. Renault going for a three-year guarantee? Now that would be bold.